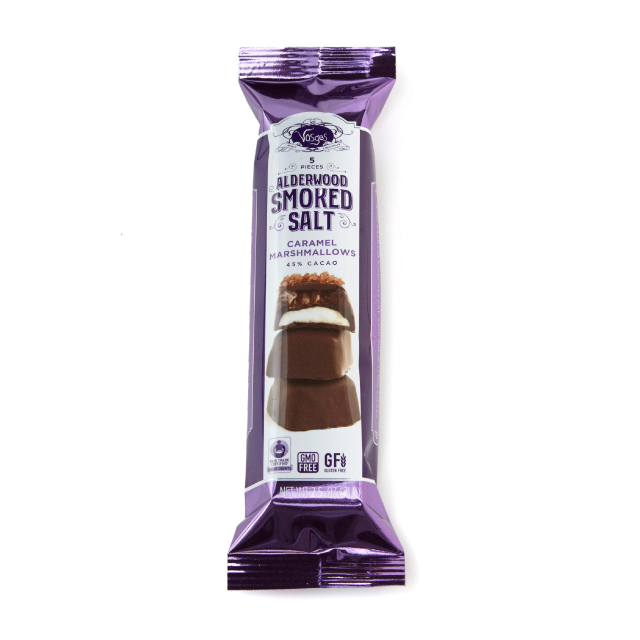 (1) Vosges Haut-Chocolat Alderwood Smoked Salt Caramel Marshmallows. Vosges is one of my favorite artisan chocolate brands -- and I had the good fortune to visit their corporate headquarters in Chicago last week to get a behind-the-scenes look at how their chocolates are created and manufactured. One of the items I sampled during my tasting was their Alderwood Smoked Salt Caramel Marshmallows. Soft homemade marshmallow cream is topped with a square of soft, burnt caramel. Then, each square is covered with Vosges' deep 45% milk chocolate and a sprinkle of Alderwood smoked salt. These sophisticated little bites are a perfect combination of chocolate, sweet marshmallow, and deeply rich caramel. 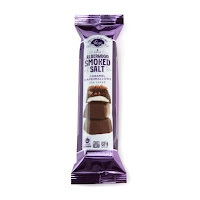 Each package contains five two-bite squares...and retails for just $5.oo via the Vosges website. That's a lot of chocolate bang for your buck! (2) Texas BBQ: Platefuls of Legendary Lone Star Flavor Cookbook. Being a native Texan, this cookbook immediately grabbed my attention! My family makes BBQ almost year-round, so we're always on the lookout for new recipes. This cookbook is from the editors at Southern Living, so you know the recipes are legit. From learning how to achieve the caramelized bark and tender pink center of my state's signature smoked brisket...along with recipes for delicious side dishes accented with flavorful influences brought by German, Spanish, and Czech settlers. This fabulous cookbook contains more than 100 authentic recipes from the state of Texas -- including appetizers, side dishes, and indulgent desserts. The book also provides tons of great tips and tricks to help you master the art of Texas BBQ from expert pitmasters. 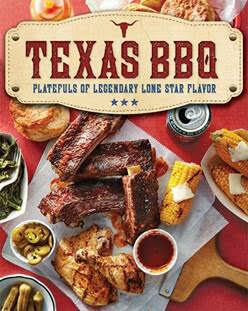 Texas BBQ: Platefuls of Legendary Lone Star Flavor can be purchased from bookstores nationwide -- including Amazon. 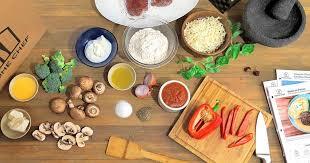 (3) Home Chef Meal Delivery Service. Meal kit subscription services are a great option for busy cooks! I recently tried Home Chef Meal Delivery service, and I loved how much time it saved me in the kitchen during my busy work week. Each kit contains prepped, pre-measured ingredients for three recipes. I loved being able to login to my account and select a trio of meals from multiple options for that week. It was very easy to find meals Michael and I would both enjoy eating. Each recipe came packaged separately inside the shipping box, along with clearly labeled and prepped ingredients. Each recipe also included a large recipe card with photographed, step-by-step easy-to-understand directions. Even novice cooks will get great results from Home Chef. 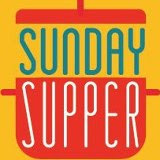 All of the dishes I tried were ready in about 30 minutes and tasted great! We especially loved the Tex-Mex Turkey Taco Salad and the Wood-Fired BBQ Chicken Pizza. To sign up for Home Chef, simply visit their website to create an account and get started! (4) Honeymoon Ice Cream. I'm all about ice cream during the long, hot Texas Summer. 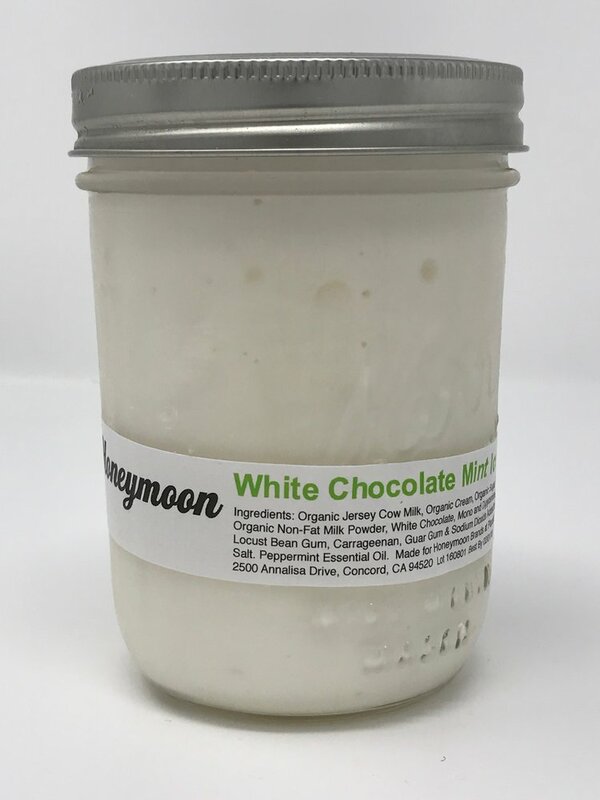 I'm always on the lookout for creative brands to try, so I was really excited to discover California-based Honeymoon ice cream. This delicious artisan ice cream brand is made with fresh, local milk from Jersey cows. Then, they flavor the ice cream with homemade ingredients like jam, oats, biscuits, and toffee. We especially liked that this ice cream isn't sticky sweet like some brands. It's creamy and lightly sweet, with unique flavor combinations. We tried a quartet of flavors, including: Berries & Biscuits (think berry shortcake a la mode! ), Southern Pecan (candied pecans + milk steeped in used whiskey barrels), and Strawberry Tarragon. Then, there's my personal favorite: White Chocolate Mint, which is flavored with spearmint and peppermint and contains mini white chocolate chips -- so good sandwiched with chocolate wafer cookies for a fun ice cream sandwich! Honeymoon ice cream can be ordered from their online store. 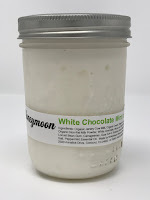 My Texas readers can find glass mason jars of Honeymoon ice cream at their local Central Market. (5) Suji's Korean Cuisine Ready-to-Eat Meals. What if I told you that you can enjoy authentic Korean food at home faster than grabbing (takeout? 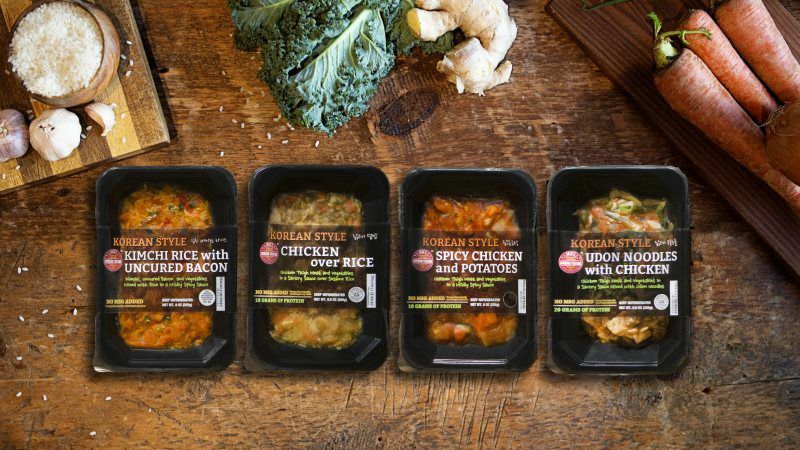 With Suji's delicious refrigerated ready-to-eat Korean meals, you can enjoy a hot Korean meal in less than 5 minutes! There are four great flavors to choose from: Korean Style Udon Noodles with Chicken, Korean Style Chicken Over Rice, Korean Style Spicy Chicken and Potatoes, and Korean Style Kimchi Rice with Uncured Bacon. All of the flavors tasted great, but I especially enjoyed the udon noodles. I picked up some takeout dumplings on my way home, and dinner was literally ready within 10 minutes of walking in the door from work! All varieties of Suji's Korean Cuisine contain no preservatives, additives, artificial flavors or colors, or added MSG. 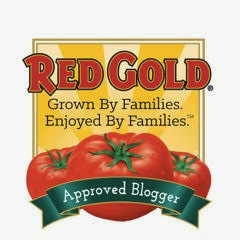 My Texas readers can find Suji's Korean Cuisine in the refrigerated meal section of their local H-E-B market. (6) Grainful Oat Meal Kit. Most of us enjoy having a big bowl of oatmeal for breakfast...but have you ever considered trying savory oats for dinner? Grainful Oat Meal Kits are a savory mix of steel cut oats, spices, and vegetables. 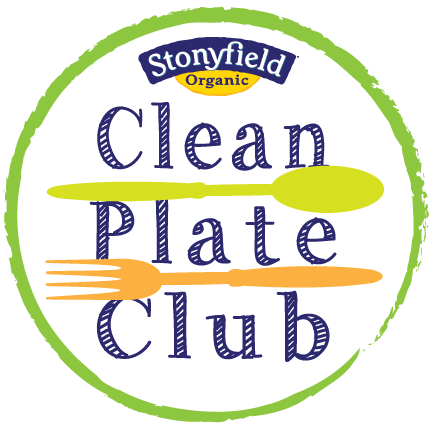 Simply add a bit of protein and you've got a hearty, delicious meal that's gluten free and full of healthy fiber! 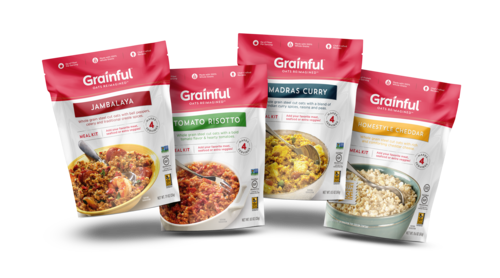 Grainful Oat Meal Kits come in four tasty flavors: Tomato Risotto, Homestyle Cheddar (my fave! ), Madras Curry, and Jambalaya. I'll admit that we were a bit hesitant at first to try savory oats...but one bite was all it took to convince us! The flavor is a bit nutty, and it was so filling. I added onion, diced tomatoes, shrimp, and chicken to the jambalaya flavor for a fabulous one-pan dinner. To find Grainful products near you, visit their handy online store locator. (7) Julio's Seasoned Tortilla Chips. We eat a lot of tortilla chips at my house, pairing them with salsa, queso, or guacamole. Earlier this year, we discovered delicious Julio's seasoned tortilla chips. These crispy tortilla chips are made in Del Rio, Texas. After the ptortilla chips are fried, they're sprinkled with Julio's savory, slightly spicy seasoning blend. One bite, and we were hooked! We love to dip these flavored tortilla chips, but they're also great straight from the bag. My Texas readers can find Julio's seasoned tortilla chips on the chip aisle at H-E-B and Walmart Super Center locations in Del Rio, San Antonio, Houston, Dallas, Lubbock, Lufkin, and the Lower Rio Grande Valley. Live out of state? No worries! Julio's also sells their entire line of products via their online store -- and they ship nationwide. (8) Community Coffee Amber Sunrise Blend. Louisiana-based Community Coffee is a staple here in the South. They recently released their new Amber Sunrise Blend, which is perfect for coffee lovers who prefer a lighter roast coffee with a smooth finish. This coffee blend is made from 100% Arabica coffee beans. It smells great as brews, and the taste is truly smooth. I like to add creamer and sugar to my coffee, and I loved that this blend was especially smooth and much less acidic than typical coffee blends I've tried. Community Coffee Amber Sunrise Blend coffee can be found at grocery stores in the Southeastern U.S., including: Albertson's, Brookshire's, Brookshire Brothers, Randall's, Rouse's, Spring Market, Super 1, Tom Thumb, and Winn-Dixie. If you live in other parts of the U.S., Community Coffee can be purchased via their online store. 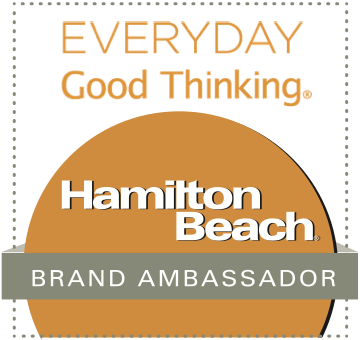 Disclosure: The makers of the products featured in my Wendy's Favorite Things column provided me with sample products to try out in my kitchen. I only recommend products that I have personally tried and enjoyed myself. All opinions expressed are solely my own.